I have used candles, headlamps, and at least one portable camping light to provide lighting for reading and writing at night in camp. A drawback of all those tools is the glare of the lamp. By contrast, this simple system is easy on the eyes. 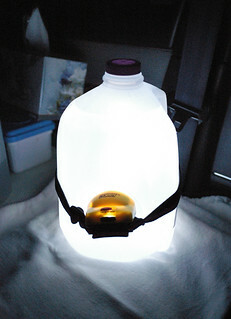 It is a gallon milk jug filled with water with a headlamp pointing into the water. One gallon is 3.78 liters. This picture was taken inside my Subaru station wagon while I was lying in bed, working on my trip journal. The system works well on a picnic table too.